It's funny how your goals change. I remember "qualifying for Boston" was one of my early goals - it entails running a Marathon in 3:15 or less. By the time I had tamed the Marathon in my head, this goal came and went without my even noticing that I had achieved it. To some extent, something similar is happening with the Ironman - although I don't want to speak too soon! That is to say, at first the challenge seems daunting, impossible even, and as you get the training under your belt, you become more confident until you are absolutely SURE that you will achieve it. The problem is, once you get to this point, it almost seems pointless the actual achieving of it. I mean, if you know you can do it, why bother? This was how I felt at the end of my disastrous first Marathon - I knew I would eventually cross the line but so what? The 2011 Boston Marathon was at the weekend and it sounds as though it must have been incredible. No less than two (Kenyans obviously) ran the course under the World record time of 2:03:59 and Ryan Hall, the fastest American Marathon runner, registered a spectacular time of 2:04:58! Unfortunately, Boston Marathon does not qualify as a course on which World records can be broken because it is a slightly downhill, point to point course (which can benefit, as it did this year, from a tailwind). 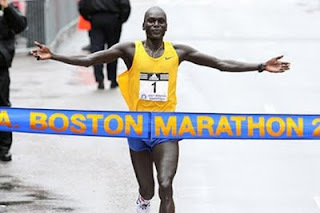 Boston Marathon is special for two reasons - firstly, it is the longest running Marathon having started in 1897, the year after the Olympic Marathon, and secondly, the strict qualifying times mean that there is a generally higher standard. It also has an unbelievable atmosphere or so they say. For many runners, qualifying for Boston Marathon is the equivalent of qualifying for Kona (the Ironman World Championships in Hawaii). Last year the race numbers sold out in 8 hours so they are changing the registration this year. First they will open the registration to those who are more than 20 minutes faster than the qualifying time (for their age group), then to those who are ten minutes faster, to those who are 5 minutes faster and finally, to all those who have qualified. Luckily, I was over 5 minutes faster so I will be able to register just before everyone else (assuming there are still slots available!). For 2013, they will be making the qualifying times 5 minutes faster across the board (although I will be in the next age group by then, so it will be the same cutoff for me). It looks as though I will be doing Boston and New York next year unless, of course, I get lucky and get picked out of a hat for New York this year. I go to Boston a lot and, although I've never been there in the Marathon day, I can assure you that the city goes mad about it. I came back from there last week, just before the race. All running shops are full of information, there are news everywhere about it... the race day must be amazing. I have to improve a lot my time to even think about qualifying, but if I ever get that fast I'll sure try to go. BTW, you can get in even withouth the requiered time through a charity. A few are given some slots and they then auction them. I've heard that you can usually get a slot at around 3000 usd. It may feel weird, but if you already qualify and can afford it I think it's worth thinking.